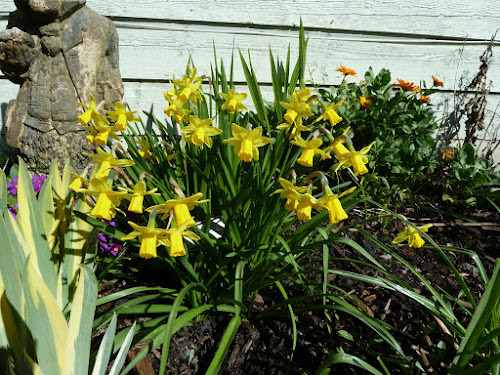 My Home and Garden: Tete a Tete Narcissus. Aunt Helen's Daffodils. They are close, but not the same. Tete a Tete Narcissus. Aunt Helen's Daffodils. They are close, but not the same. Back in 2013 I wrote this post with this photo of the beautiful little yellow narcissus that I brought from my Aunt Helen's place in Muskoka a year earlier. They are now in the garden and a gorgeous clump that I just cannot stop looking at. They are so bright and cheerful. 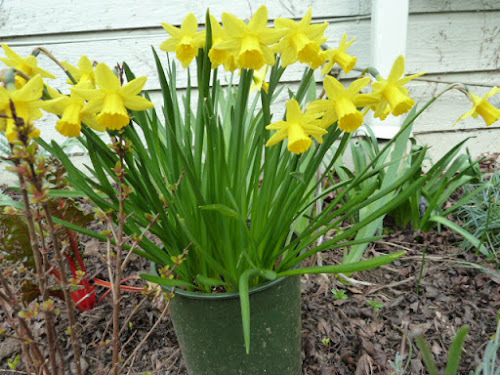 Last year I discovered the adorable little Tete a Tete Narcissus and planted some bulbs. I thought I may have found the same variety. This year I can see a major difference. The Tete a Tete's can have double and triple flowers per stem. Not always but sometimes they do. My Muskoka Narcissus, never have a multiple flower. So I will keep looking. But in the meantime I will have more and more sunny, bright yellow sunny flowers each year. I will divide the Muskoka's and keep planting new bulbs every fall. Gosh it's good to be getting in the garden again. I have missed it so much! !